Technology involves the purposeful, practical application of knowledge, experience and resources to help develop, make, use and appraise products and processes to meet human needs. In Technology students use their imagination and skills to make things. They research what has to be done to design and create a solution to a problem. Investigate and manipulate materials, information and systems. Apply an innovative, design based, problem solving approach to achieving practical outcomes. Use knowledge and experience to create products and processes. Critically appraise the function and impact of products. What Is the Technology Program in Each Year? Emphasis is placed on safety and the development of skills so all students can enjoy participating. Food Technology 8 - focuses on the packaging, advertising and marketing of food products as well as investigating how and why certain foods are used for special occasions in Australia. It includes practical activities which encourage students to challenge themselves and build on their skills to create a range of dishes. Graphics Technology 8 - Students will be introduced to the skills necessary to prepare two and three dimensional drawings using computer-aided drawing and graphics software and rendering techniques. Students will solve design problems with graphics as the means to express their ideas and solutions using computer programs and hand drawing skills. Workshop Technology 8 is a practical unit where students make and appraise products using wood, graphics, metal and plastics. While working with materials, students study the design implication of each project. Students learn to appraise their own work objectively. Textiles Technology 8 - students will have the opportunity to investigate their creative and artistic potential using textile mediums. Emphasis is placed on developing machining skills and applying decorative techniques to produce a product. Students are introduced to the skills necessary to be able to use various Adobe software programs such as Photoshop, InDesign and Flash to produce a range of digital artworks and animations using the principles of design. They store these in a digital portfolio and explore a range of other options to display their work. Students are provided with the opportunity to develop sewing skills and garment construction techniques while designing, making and appraising casual and leisure items. Students also investigate the fashion industry, mass production techniques and changes in technology within the fashion industry and label design. 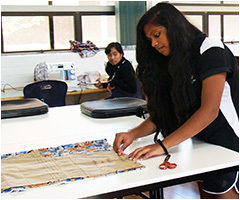 Students investigate their creative and artistic potential using techniques such as painting, dyeing, printing, felt making, quilting and machine embroidery. This unit aims to build upon the skills developed in other food technology classes. Emphasis is placed on the aesthetic, social and nutritional appeal of food preparation and presentation. Students learn about various key ingredients, fruits and vegetables over the course of this unit. Students will have the opportunity to participate in a cookery competition, which aims to develop creativity, presentation, technical and teamwork skills. Students will also, plan, prepare and run a soup kitchen or café style luncheon for staff. Young Chefs 2 will continue to build on the knowledge, skills and techniques developed within the Young Chefs 1 course, allowing extra opportunities for students to extend their food technology skills. This unit provides students with the opportunity to be creative in the preparation of their food, using everyday ingredients. Plating and garnishing form the basis for the creativity in presentation whilst learning the range of cooking methods that may be adopted. This unit focuses on the development of Australian eating habits through a study of Aboriginal foods, white settlement and immigration. It looks at the effect that these historical and cultural factors have on Australian eating healthy. This is a competency based course which provides students with the opportunity to develop vocational skills and nationally recognised training necessary for food preparation, catering operations and presentation in the hospitality industry. Students in year 10 may have the opportunity to gain a Statement of Attainment or Certificate 1 in Hospitality. Students learn about health, safety and security procedures, workplace hygiene procedures, espresso coffee service as well as preparation and serving of food and beverage to customers. Students gain valuable industry experience by working in the Tea Tree Café once a fortnight. 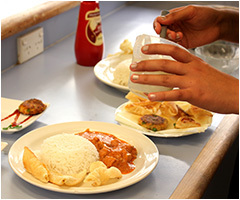 Students will be required to occasionally work in the school café during lunchtime, as well as assist in preparing food for various school events and functions. This is a competency based vocational skills course and has been designed for students who are hoping to find employment within the Construction Industry. Students will be exposed to many of the skills involved with trades such as Carpentry, Bricklaying and Concreting. Students are introduced to the key work skills and Occupational Health and Safety requirements of the trades within the Construction Industry. Students work towards competencies that are nationally recognised to go towards a Statement of Attainment or Certificate 1 in Building and Construction. This unit will also provide an opportunity for students to undertake their White Card and Asbestos Awareness training to prepare them for work experience placements and structured work place agreements. In this unit, students focus on the design cycle to investigate, design, make and appraise projects from a given design brief to completion of a prototype. 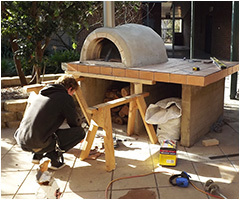 Students will use a variety of tools and construction techniques. This unit provides students with the opportunity to discover and develop skills in woodwork and design. Emphasis is placed on skill development, attention to detail, safe and appropriate use of tools and equipment, knowledge and understanding and the development of a portfolio. This unit provides students with the opportunity to discover and develop skills in four main modules of work: wrought iron work, metal machining, sheet metal work and welding/fabrication. Each module of work will be completed each semester with all module projects to be offered and graded according to previous metal workshop experience. Students are encouraged to, upon completion of compulsory work, complete extension projects from these modules. A workshop folio is completed to cover all non-practical components of the course. This unit provides the opportunity for students to design, produce and present numerous pieces of quality jewellery. Students will be introduced to variety of tools and techniques to produce their projects. Using the design process, students will make set and negotiated projects to match their current practical skills. This unit utilises a practical integrated approach with Engineering and Technology concepts being used to drive interest in Science and Mathematics, through the development of technical skills and mechanical engineering knowledge. i-STEM is a hands-on, inquiry based course in which there are many points at which students raise and explore ideas. This course will show students how scientific methods can be applied to everyday life. Students will learn computational thinking and focus on the real world applications of problem solving. Students will learn to use a range of tools, techniques and processes, including relevant technologies such as 3D printing and laser cutting in order to develop solutions to a wide variety of problems related to their present and future needs and aspirations. Units include: Engineering Fundamentals, Aerodynamics, Motion and Mechatronics.